Bitcoin trading bots will no longer be the exclusive preserve of software and finance wonks if startup Tradewave has its way. The London-based company has developed a platform that lets users create their own trading bots, stripping away some of the complexities of programming such tools independently. Trades placed by software have seen explosive growth in the established financial markets. High-frequency trading, which is conducted by algorithms, accounts for up to three-quarters of trading volume in US stock markets, according to the Bank of England. This has grown from less than 20% of trading volume in 2005. 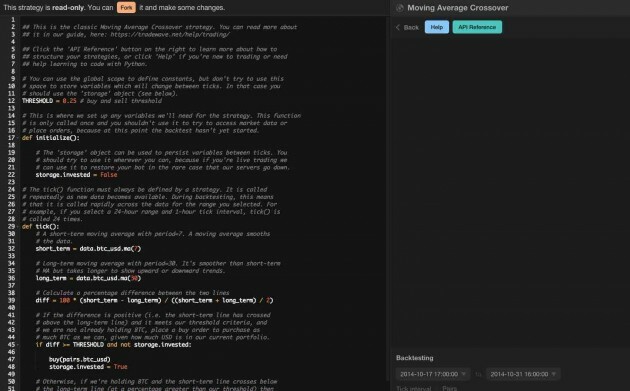 Tradewave lets users write trading strategies in Python, a programming language. The Python scripts are run off Tradewave’s website, which means users don’t have to set up a programming ‘environment’ to operate their bots, which can be a cumbersome process. Users can pay $19.99 a month to connect their Tradewave bots to four exchanges: Bitstamp, BTC-e, Bitfinex and Kraken. The Tradewave bots can then buy and sell on those exchanges on the user’s accounts. Potter said he has raised seed funding for Tradewave from a prominent angel investor in the cryptocurrency space, who he declined to identify for the record. Tradewave began as a side-project for Potter, who has worked as a software engineer for startups in Silicon Valley. Initial postings about the platform on Reddit, Bitcoin Talk and Twitter last December garnered about 1,000 users, he said. He declined to say how many users he currently has on the platform. Although Tradewave users currently have to write their trading strategies in Python, Potter said he is working on simplifying that process. 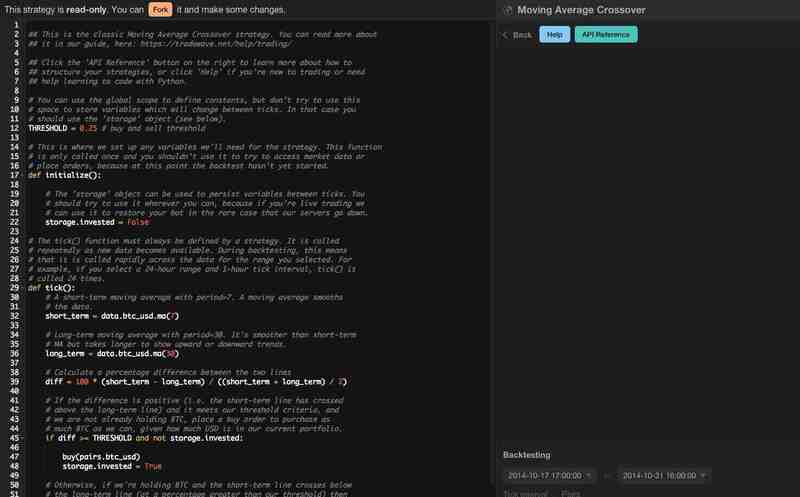 His platform will let users create strategies in simple English, keeping the programming language hidden. He plans to release this feature in two to three weeks, he said. Even if users write strategies in English instead of Python, is there a market for DIY bitcoin trading bots? Potter, for one, believes a niche exists. By his estimates, about 50,000 individuals trade actively on the cryptocurrency markets, and he’s betting that some of them will pay for a sophisticated tool like Tradewave. Trading bot software has proliferated in the cryptocurrency markets. 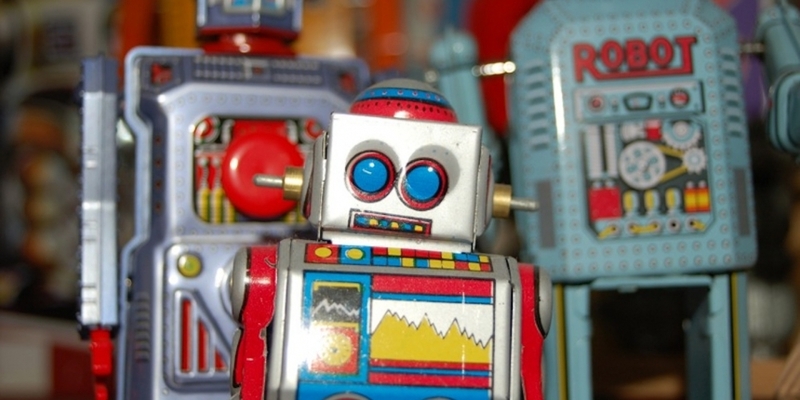 Off-the-shelf bot subscriptions, like at Butter Bot, can be purchased for about $140 a year. Opensource bots, like RBTC Arbitrage, can be installed for free. In the wider financial markets, a startup called Quantopia has raised millions to build a platform that allows individuals to create their own automated trading methods. A new bitcoin-based derivatives platform, First Global Credit, said it’s developing an API to allow automated trading because of demand from its clients. A former bot trader, Joseph Lee, wrote his own software to execute trades, claiming to have made $200,000 in profits. Today, Lee doesn’t run his bots; instead he operates derivatives platform BTC.sx. He said he is also seeing demand from his customers for automated trading. Lee added that services like Tradewave are useful for introducing algorithmic trading to the cryptomarkets because they remove some of the tedious but complex tasks – like back-testing trading strategies – involved in creating a bot. “The tricky part, back-testing the algorithm, requires large datasets and a lot of number crunching. This requires development skills … easy if you know how, difficult if you don’t,” he said.